The new Interstate 495 Express Lanes on the Virginia side of the Capital Beltway opened Saturday at 4 a.m., two hours behind schedule. By 8 a.m., the new lanes had experienced their first two accidents. Virginia State Police confirmed two separate accidents on the inner loop at Braddock Road (Route 620). The first accident, which happened at around 7 a.m., had been cleared away by the time of the second accident, which took place at around 8 a.m.
A third accident took place at around 11 a.m. on the northbound side of 495 at the 55.8 mile marker, south of Braddock Road. Virginia State Police say that two cars were involved in the accident. All but one lane on 495 was closed while this accident was investigated and cleared. There have been no reports of any injuries in any of the crashes. 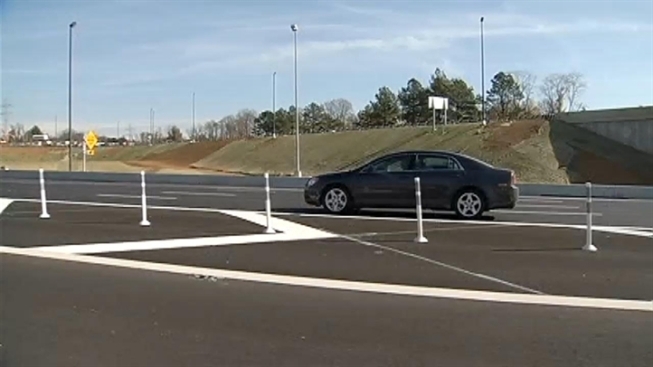 The new lanes mean drivers will have to learn a new set of rules on this high-tech road. Tolls on the lanes will change depending on how heavy traffic is on the road. When traffic is light, the tolls will be lower to encourage use of the Express Lanes. When traffic is heavy, tolls will rise to keep fewer drivers on the road. Carpooling with three or more people in the car, however, is always free. For a set of Frequently Asked Questions about the Express Lanes, click here. The "high-occupancy toll," or HOT, road was built with high-tech sensors to detect the amount and speed of traffic and adjust tolls accordingly. Toll prices will be displayed on signs before drivers enter the lanes. But the tech does not end there: there are no toll booths; instead, the "all-electronic" road will require use of E-ZPasses, reported News4 transportation reporter Adam Tuss. Even carpooling will be detected with via use of the E-ZPass Flex; drivers must switch the transponder to carpool, or HOV, mode to show that they have more than three people in the car. Virginia State Police will watch for those cars and visually check them to ensure they do have enough carpoolers to qualify for the free ride. The entire span is monitored with cameras from a sophisticated control center. Because using the road is complicated, Virginia DOT officials suggest that drivers prepare by planning their trip carefully. They have a website about the lanes that drivers can use to prepare. The new road runs between lanes of the Beltway from about one mile after the George Washington Parkway/Georgetown Pike exit. It ends at the I-95/I-495 merge, near Springfield. The goal of all that traffic control is to keep traffic flowing at at least 45 miles per hour, Tuss said. The Express Lanes' first official rider had no problem maintaining speed: Santa rode down the Express Lanes Friday afternoon in an arctic white convertible. No word on what his toll turned out to be.